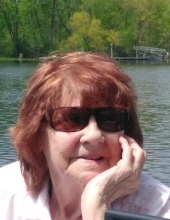 Julia Ferow, age 81, of Lapeer, formerly of St. Helen and Auburn Hills, died Wednesday, March 27, 2019. She was born October 8, 1937 in Indianapolis, Indiana, to Vern and Esther (Bolin) Eddy. Julia married Kenneth Robert Ferow on October 3, 1957 in Riga, Michigan. Mrs. Ferow was a private person, who loved time with family. Julia is survived by her children: Vickie (Jeff) Knirk of Houghton Lake, Dale (Lisa) Ferow of Fowlerville, Michigan, Denise (Jim) Tucker of Lapeer, Mary Ferow of Naples, Florida, Darlene Ferow of Armada, Susan Ferow of Naples, Florida and Daniel Ferow of Armada; many grandchildren and great-grandchildren; and several nieces and nephews. She was preceded in death by her husband: Kenneth Ferow in 1972; son: Dennis Ferow; brothers: Fred Eddy and Nelson Eddy; and her parents: Vern and Esther Eddy. A memorial gathering to celebrate Julia’s life will be held 4-8PM Friday, April 5, 2019, at Muir Brothers Funeral Home in Lapeer. No formal funeral service will take place. In lieu of flowers memorial contributions may be made to McLaren Hospice, 1515 Cal Drive, Davison, Michigan 48423. Cremation has been entrusted to Muir Brothers Funeral Home in Lapeer. Please share condolences and memories at www.MuirBrothersLapeer.com..
"Email Address" would like to share the life celebration of Julia Ferow. Click on the "link" to go to share a favorite memory or leave a condolence message for the family.